Natalie B Photography: Precious 8 day old Newborn baby "A"
Precious 8 day old Newborn baby "A"
Nothing is more delightful then photographing a brand new baby. Yesterday I was able to meet and photograph 8 day old baby "A". It only took us an hour to get him to sleep and then he was so good for me. We were able to pose him in the sweetest positions! I left there really wanting a baby myself! Well then reality hits I have 3 kids of my own, but oh man those babies! 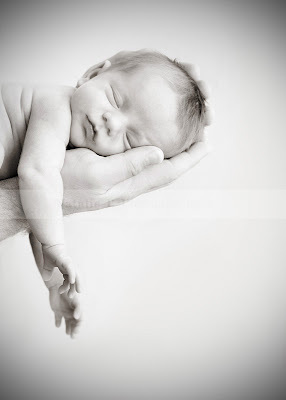 Someone call me soon to photograph another newborn to satisfy my baby yearnings! Look how precious his little peanut head is in his father's hands. Awww!! What a cutie! Love, love, LOVE #2. Nicely done, Natalie! Beautful Natalie...... You have such talent.